The global adult hemoglobinopathy testing market is projected to grow at a CAGR of 3.9% throughout the forecast period (2018–2026). Favorable reimbursement for adult hemoglobinopathy testing is expected to drive the growth of the adult hemoglobinopathy testing market over the forecast period. Offering of prenatal testing and use of advanced molecular testing are expected create lucrative opportunities for the new players entering the adult hemoglobinopathy testing market. Development of various rapid POC diagnostic methods for sickle cell disorder and thalassemia is expected to spur the growth of the market for adult hemoglobinopathy testing over the forecast period. The increase in number of cases of hemoglobinopathy in Northern and Central Europe, particularly in Germany, owing to immigration is expected to drive the growth of the market for adult hemoglobinopathy testing over the forecast period. Around 15 million people across the globe suffer from thalassemia disorders and nearly 1.5% of the world population is estimated to be carrier of β-thalassemia, which are the other factors expected to drive the growth of the global market for adult hemoglobinopathy testing over the forecast period. Asia-Pacific adult hemoglobinopathy testing market is projected to have continuous growth over the forecast period due to increasing prevalence of hemoglobinopathy in various ethnic groups. Robust research and development related to hemoglobinopathy testing have given rise to development of various new diagnostic techniques such as cation-exchange HPLC, point-of-care lateral flow immunoassay, colorimetric quantification of PCR-amplified DNA, molecular identification of alpha and beta chain mutation analyses and HPLC tandem mass for identification of hemoglobin variants, which are expected to create numerous opportunities in adult hemoglobinopathy testing market. Premarital and prenatal genetic testing for the sickle cell trait identification is rapidly gaining popularity in developed as well as developing countries, which is projected to spur the growth of the adult hemoglobinopathy testing market over the forecast period. Over the last decade, the leading companies operating in the adult hemoglobinopathy testing market are focusing on advanced diagnostics and therapeutics for adult hemoglobinopathy testing. Hemoglobinopathy is one of the most common hereditary diseases worldwide. Hemoglobinopathy encompasses genetic disease of hemoglobin, which falls mainly into two groups, i.e., thalassemia and structural hemoglobin variants. Hemoglobinopathy disorder is caused by the presence of variant hemoglobin in the red blood cells. The adult hemoglobinopathy testing market is segmented on the basis of variant type, test type, end users and region. 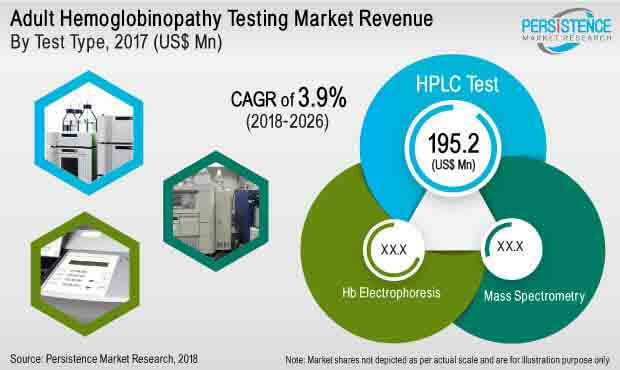 On the basis of test type, the HPLC test segment in adult hemoglobinopathy testing market is expected to account a large revenue share over the forecast period owing to its accuracy and use of HPLC as compared to other segment test types. However, lack of awareness regarding hemoglobinopathy testing and disorders among the general population, especially in underdeveloped and developing economies, high prevalence of the disease, highly complex tests for hemoglobinopathy, and lack of access to screening procedures with various accurate technologies, such as genetic testing, are some of the prime factors expected to hamper the growth of the adult hemoglobinopathy testing market over the forecast period. The global adult hemoglobinopathy testing market is segmented into six key regions, namely North America, Latin America, Europe, and Asia Pacific excluding Japan, Japan, and the Middle East & Africa. In terms of value, Europe is a large regional market for adult hemoglobinopathy testing and is expected to have significant growth during the forecast period. The Asia Pacific excluding Japan adult hemoglobinopathy testing market is projected exhibit significant growth over the forecast period due to increasing prevalence of hemoglobinopathy in the region, particularly in China and India.